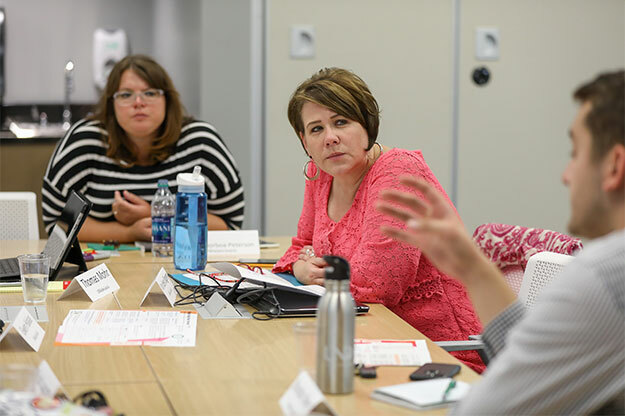 Maridee Shogren, of the College of Nursing & Professional Disciplines, listens to a point from UND Student Body Vice President Blake Andert, with Stacey Borboa-Peterson, director of Multicultural Programs & Services, looking on in the background, during a work session for the UND Strategic Planning Committee. Photo by Shawna Schill. 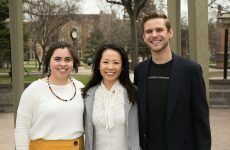 At the beginning of the fall semester, 45 people were chosen to serve on the Strategic Planning Committee which has with the great responsibility to lead the effort of strategic planning for the University. The diverse group of faculty, staff, students, alumni, and city leaders with different voices and perspectives have devoted hours of their time and talents to develop, debate, engage, and redefine the first major milestone of the strategic planning process: finalizing the Core Values (see below). President Mark Kennedy set the stage by framing UND as the chief opportunity engine for North Dakota and North Dakotans. Our vision is to be the premier flagship university in the Northern Plains. From there, we as Co-Chairs began the collaborative process of working with the Strategic Planning Committee to draft several versions of the Core Values. This first step was critical to the strategic planning mission because the Core Values are the heart of the University; it is what brings us together; it is what binds us. Our hope is that the strategic planning process and the outcomes will bring us closer to OneUND. Through several meeting sessions and work groups, the Core Values evolved into a set of draft Core Values that were presented to the wider campus community. The Strategic Planning Committee urged the campus to engage, envision, and empower the process of developing the Core Values through 11 Campus Conversations held over a two-week period in October, as well as through other engagement opportunities, and the online blog. 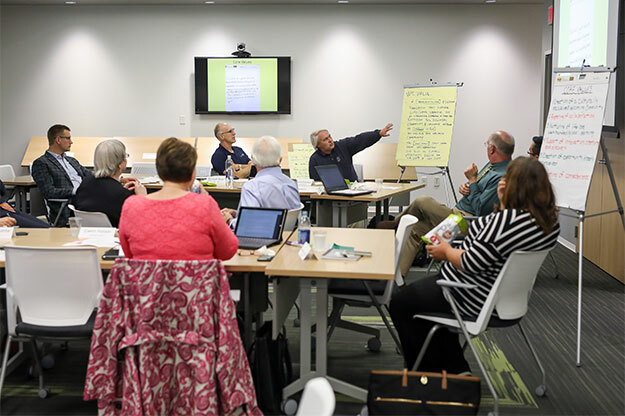 Members of the UND Strategic Planning Committee discuss Core Values for the University as part of a strategic planning work session held at the beginning of the Fall Semester. Core Values are the “heart of the University; it is what brings us together; it is what binds us,” according to the committee’s Co-chairs. Photo by Shawna Schill. More than 250 students, faculty, and staff provided feedback during the engagement process. They gave open and honest feedback on the Core Values. Not surprising with something this critical to our University, we experienced the passion, the thoughtfulness, and sometimes, the heartburn of those engaged in the process or even observing it from afar. We suspect these emotions will continue, and we hope they do. It means that people are engaged, we are continuing the conversation, and hopefully, we are moving closer together. Closer to OneUND. With feedback in hand from the Engagement Working Group, the Strategic Planning Committee received seven refined Core Values to approve. 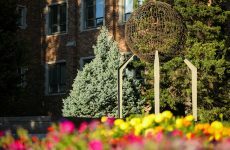 On October 26, an overwhelming 97 percent of the Strategic Planning Committee approved the Core Values. It was truly a collaborative effort and certainly deserves much praise. The Core Values are an important part of the foundation of our University and Strategic Plan, but there is still much work to do. Right now, the Strategic Committee Members are working on eight Strategic Initiatives and creating specific working groups to tackle each initiative more thoroughly, while encouraging engagement and feedback from ongoing Campus Conversations and other events. Each Strategic Initiative will relate directly to one or more of our Core Values. We will create metrics to measure our progress in reaching our goals. We will be sure to integrate UND’s Athletics Plans, Master Plan, and other planning initiatives taking place on campus into the Strategic Plan. 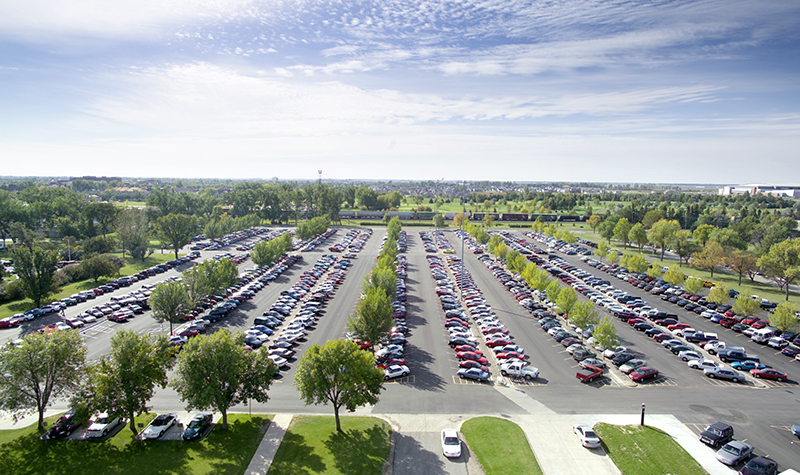 We will work together to bring all colleges, departments, and facilities together to work towards OneUND. But, for now, let’s take a minute to reflect on what will be the foundation of this plan and the heart of UND, our Core Values. These seven Core Values are the start of OneUND. Liberal Arts – An educational foundation essential for living an intellectually curious, personally fulfilling, and socially responsible life. Lifelong Learning – A passion for learning, civic engagement, and community leadership. Diversity – An understanding and appreciation of diverse people, experiences, and ideas. Inclusivity – A welcoming, inclusive, and supportive environment for all. Discovery – An enthusiasm for inquiry, creativity, and innovation. Community – A spirit of collaboration and connectedness across the university and beyond. Service – A dedication to serving the people of North Dakota and the region, and tribal, nation, and global community.